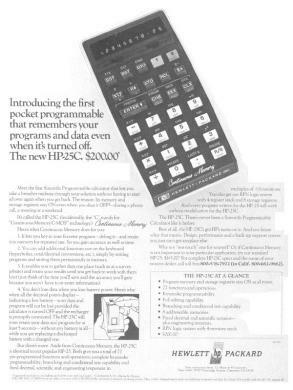 The HP 25 Programmable Scientific Calculator was released in 1975 and followed a year leter the HP 25C Programmable Scientific Calculator. This advertisement appeared in a Technical Journal in late 1976. Caption: Introducing the first pocket programmable that remembers your programs and data even when it’s turned off. It’s called the HP-25C and incidentally, the "C" stands for "Continuous Memory C-MOS" technology.